HandEra (and formerly, TRG) is a name that evokes fond memories amongst long-time Palm OS users. Originally a producer of memory and expansion modules for the early Pilot and PalmPilot line, Iowa-based TRG leveraged their engineering expertise and inside-out knowledge of the Palm OS into producing a revolutionary Palm OS device, the TRG Pro of 2000. While most Palm OS devices of the time sported 4mb or less of RAM and non-existent expansion capabilities, the TRGPro brought a 16mhz Dragonball-EZ CPU, 8mb of RAM and a CompactFlash slot to the traditional Palm III formfactor. Building upon the success of the TRGPro, the company rechristened themselves "HandEra" in 2001 and introduced the HandEra 330. 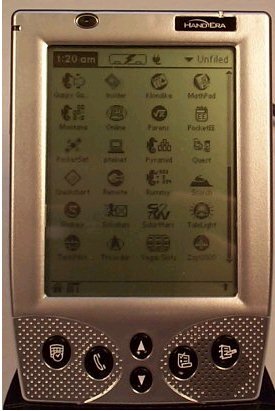 Designed to compete with both the Palm III and newly-launched m500 lines from Palm, the HE330 was the first Palm OS device to tout a virtual graffiti area for expanded LCD screen real estate. While Palm and Handspring were focusing on bright but power-guzzling backlit color screens (IIIc & Visor Prism) or dim side-lit grainy screens (m505), HandEra brought a crystal-clear 240x320 QVGA greyscale LCD to the table along with dual expansion slots (SD + CF) and a choice of power options (rechargable li-ion pack, rechargable or throwaway AAAs ). The HandEra 330, like the TRG Pro, maintained the Palm III formfactor, with the huge benefit of instant compatibility with the slew of cradles, styli, and sleds already on the market for the Palm III. Unfortunately, by 2002 the company's hardware fortunes as a Palm OS licensee begin to fade. An OS 4 upgrade for the HE330 never materialized nor did the mythical followup color device, the HE330c. HandEra was fortunately to jettison their resource-draining hardware business in 2003. They have placed their add-on software products sold to end users on the backburner following the cessation of operations by Brayder Technologies in 2006. Thankfully, HandEra have kept their streamlined operations in DesMoines, Iowa going strong ever since, operating to this day as a software and handheld consultancy firm to mobile tech companies of all sizes. They continue leverage their expertise in both hardware and software, having broaded their horizons to focus on Windows Mobile-based devices in addition to their Palm OS roots. Indeed, HandEra's combination of hardware, software, and engineering expertise quietly resides under the hood of many mobile devices on the market today. Mike Walter, Vice President of Software Development, and Doug DeVries, Vice President of Hardware Development at HandEra were kind enough to take time out of their busy schedule to answer some questions submitted by myself, Ryan, and several other members of the PalmInfocenter community. Both Mike and Doug are co-founders of HandEra and like most of the rest of HandEra's management, graduates of Iowa State University. We thank them for a handful of great products and for making true advancements of the Palm platform in its early days. I look forward to whatever projects these guys will bring their magical touch to in the future! Q: Let's start with the basics. What got TRG/HandEra interested in the PDA market in the first place? A: At the time TRG was an engineering consulting firm. As our active client list grew, it became more difficult to keep accurate track of hours. Doug DeVries began looking for portable devices to track time for different clients. The first couple of devices were essentially glorified stop watches. Later Doug heard about this new-fangled invention called a "Pilot". He bought one and even found some hours-tracking software (TimeReporter from Iambic). While researching hours-tracking software Doug came across several news groups specific to the Palm Pilot. Many people were complaining about lack of memory in the device. Rumor had it that there was an "expansion slot" inside that might someday be used for more memory. However, there was no memory upgrade to be found from Palm or anyone else. Opportunity knocks. Being a curious hardware guy, Doug soon opened up his Pilot 1000 and, a few hours later, had reverse-engineered the expansion slot. It turned out that the ROM containing the PalmOS along with RAM expansion signals were on the included expansion card. This posed a problem for 3rd parties since any add-on RAM expansion card would also have to contain the OS. Enter the software guys. Since TRG did not have a license to distribute the Palm OS, we had to provide a method for end-users to transfer the OS from one expansion card to another. Palm was not exactly pleased with this, but since end users the ones transferring the images, they really couldn’t do much about it. Due to memory prices at the time and Palm’s use of PSRAM rather than DRAM, our first expansion module sold for around $250! Q: The Color HandEra 330 has become a thing of legend amongst the long-time Palm OS users, especially a handful of veteran users here at PIC. What light can you shed on this mythical creature? In particular how close was it to a production state and can you list the general specs of the device? Was the 66MHz Dragonball a possible CPU choice at the time? I've always felt the 66mhz Dragonball an underutilized CPU for its time, having a solid price/performance/battery life ratio and should have been utilized in more devices. A: The Color HandEra 330 was very close to production. Unfortunately in our production volumes, the cost of the HE330C (code named Kepler) was more than the market would bear. At the time we were strapped for cash and the dot-com bust was beginning so we decided not to launch. We were lucky to get out when we did. Q: What were the main issues/concerns that lead to the decision to discontinue your PDA production? Do you feel that HandEra was more naturally suited (cashflow reasons aside) to being a software company than a hardware company? A: HandEra and Palm could not come to an agreement when it was time to renew HandEra’s license contract. HandEra’s guaranteed volumes for the new agreement was greatly increased over the original agreement. It was painfully obvious that Palm was only interested in licensees with VERY large volumes. The negotiations drug on for over a year, but in the end our volumes just couldn’t support the cost of the OS. We had no choice but to abandon the PalmOS and move to WinCE. Regarding the hardware / software company question…we feel that we are equally strong in hardware and software. Of course, it takes a lot more cash to bring a hardware product to market and unfortunately revenues from software alone were not enough to support the company. Q: What were some of the chief reasons surrounding HandEra’s OS4 licensing woes? The revolutionary hardware was certainly up to the task of running OS4.x! Q: Did the inability to ship new units with OS4 and upgrade older units influence in any way the decision to cease production of HandEra’s hardware line? A: Yes. We could not obtain a 4.x license. Game over. Q: Ouch! Do you think the HE330’s lack of a brick & mortar retail presence really hurt its chances? I recall seeing only one HE330 out in the wild (I never buy anything with a screen unless I can see and play with it in person) at the local Sam’s Club. When I went back two weeks later to buy it (having made up my mind that I didn’t need the m505’s color screen) they were gone and never seen on Sam’s Club’s shelves again. I ended up with an m505 and was never truly satisfied with that particular device. A: Yes, our lack of presence in retail stores hurt us - definitely. Believe it or not, we actually made it into CompUSA, Sam’s Club, Franklin-Covey and a small chain called American. Just getting into these few stores took tremendous effort and cash, cash, and more cash. For the uninitiated (like us at the time), all the products that you see on the retail shelves are there on consignment. The retailer pays 30, 60, maybe 90 days after the consumer buys. The cash outlay to put even 5 units in all of our retail stores was a relatively huge cash consumer. Returns were another problem. One time we had a TRGpro returned from one of our retailers with the TRGpro plastics, but a Handspring motherboard inside. It was taped together and obviously a violation of the warrantee but the retailer took it back, so guess what, we had to take it back too. The retailers have all of the leverage in this respect. Another time a hole was literally drilled through the CPU with a 1/8" drill bit. The problem description was "doesn’t work". Q: Finally, since hindsight is always 20/20, do you wish that a bit more attention had been paid to the styling of the HE330? Its light silver finish and the little holes surrounding the speaker and hard buttons became something of a running joke amongst the Palm OS community. Do you wish you’d changed the front speaker design and gone with a darker matte black finish (like the cool IBM Workpads for example)? A: Well, you can’t accuse us of over-spending on the industrial design. We had a self-imposed requirement of keeping the HE330 the same form-factor as the PalmIII. After all, we had no custom accessories to offer and our vertical market clients did not want the form factor to change one bit. There is only so much you can do. The chrome plating of the HE330 (although ugly) provided mechanical strength and rigidity. On the HE330c we actually employed the services of an industrial design firm. They still could not change the form-factor, but they did much better on the colors and styling. We weren’t totally happy with the alternating button colors on the HE330C, but it still better than the all-chrome look of the HE330. Q: Are the devices HandEra is commissioned to develop these days variants of the typical touchscreen handheld computer, or are your customers asking for new form factors? A: Our products and products that we develop for other customers are, not surprisingly, mostly mobile, hand-held devices. Q: Are you being commissioned mainly to do devices for vertical markets or are customers commercializing your devices for broader markets? A: We have not done a mainstream consumer product since the HE330. Our current hand-held products are strictly for vertical markets. Our engineering services clients have products in vertical and broader markets. Q: What kind of wireless networking are your customers looking for these days? WiFi? WAN (cellular)? Bluetooth? A: All of the above plus others such as Zigbee & WiMAX . Coincidentally we are close to release on a small form-factor WiFi module. It has mobile modular approval which makes it easier and less costly for our customers to integrate it into their products. Q: Are you developing things that would qualify as mobile phones? Similarly, do you see any future in devices similar to the Nokia 770 Internet Tablet--that is, a larger formfactor than traditional PDAs but smaller than a tablet PC with an emphasis on multimedia functions (PMP) and multiple methods of wireless connectivity in addition to the usual PDA capabilities? A: We’ve recently designed a PDA product for blind users. The form-factor is that of a typical PDA, but it contains no LCD. The main I/O is audio and keypad. A version of this product will contain a GSM cell-phone module. Q: If you were designing a mobile unit (any OS) today, what feature set would you want to seen included (what specs should it have etc)? And how would the same question apply IF you had a pile of cash to burn but had to work within the realistic limitations of Palm OS 5.x? A: Ask ten different people and you would get ten different answers. I would be happy with several of the current smart phone offerings. A: That all depends on the word "custom". We have a line of pre-designed processor modules running WinCE that can lower the NRE of a customized device. We have customers selling in the 1K-10K/yr volumes using these modules. For a fully-custom design, you probably should budget at least $1M in engineering. If HandEra is involved in producing the end product, then the NRE could be partially amortized across unit volume. Most of our customers start with one of our basic designs, thereby lowering the NRE. Q: What advice would you give to Palm concerning current product features (software and hardware)? A: Call us crazy, but we would love to see a flip-style PalmOS phone. We worked on one such design many years ago for Samsung, but it was never released. On the software side, we’d like to see Window’s Mobile, but with the PalmOS look and feel and the ability to run Palm apps. Oh wait, it looks like Palm might eventually do that! Q: Do you think Palm should maintain their dual-OS strategy? Can OS Garnet (AKA "FrankenGarnet") be massaged into a serviceable low-end mobile OS for another several years? A: We have no inside knowledge of this, but it appears to us that Palm wants to run PalmOS apps on Windows Mobile which would be a great differentiator in the smart phone market. Q: Assuming Palm ever releases another non-keyboard product, do you think Graffiti 2 is still the optimal method of stylus-based character input or is the iPhone finger-pointing to the future? Is there any chance of HandEra licensing the excellent single-stroke Graffiti 1 libraries from Xerox and offering them for sale to Palm OS 5.x owners? A: We are still big fans of the Graffiti 1 input method. If Palm couldn’t license it from Xerox and instead had to come up with Graffiti 2, I seriously doubt that HandEra could. Regarding the iPhone finger navigation, do you want your greasy fingers touching what you are looking at? This has been tried and has failed many times in the past, but maybe Apple can pull it off. Q: Do you think Palm’s Treo-only attitude of late is proper or will there always be a niche for a few dedicated PDA models? Wouldn’t it appear that Palm has the "budget" standalone PDA market ($150 and below) completely to themselves? A: That’s a good question. Undoubtedly there will be some market for stand-alone PDAs for a long time. However, it may not be worthwhile for Palm to go after that dwindling market. Q: Do you now consult for Palm or other mobile companies? Are you free to mention some of them (past or present)? Any particular highlights and lowlights? A: Without being specific, HandEra has had at least some involvement in a large percentage of PalmOS devices. Due to NDAs, we really can’t elaborate. Q: Have you ever had the opportunity to meet or speak with Jeff Hawkins or Donna Dubinsky in any capacity over the years? Are you following their current activities at Numenta? A: We have met both of them on a couple of occasions, but they probably would not remember us. We haven’t really kept track of what they have been doing lately. Q: Do you think Hawkins has it in him for one more homerun in the mobile tech market? Have you read On Intelligence? A: Undoubtedly Jeff is a very smart guy, but timing and luck have more to do with hitting a home run like the Pilot than anything else. Q: Apple’s iPhone is getting all of the industry buzz at the moment. Any initial thoughts or criticisms or is it simply too early to prognosticate? A: It’s too early to tell. It looks like another smart phone to us, but then again, we didn’t think the Internet had much promise beyond downloading Doom levels in the early1990s! Q: The big competitor to Windows in the embedded systems market is Linux. Does HandEra have any interest in embedded Linux? A: We have done a Linux hand-held design, but our core competence now is WinCE, and, of course, PalmOS. Thus far, none of our customers have expressed any interest in ALP. Q: Based on the businesses that request assistance from HandEra for various projects, can you discern any particular trends for the future of mobile devices (especially industrial-style units for business)? A: We see most demand for WinCE and of course, wireless, wireless, and wireless. Q: Can you comment on the Janam ruggedized Palm OS handhelds that were recently announced? Any connections between HandEra & Janam or is Janam a venture strictly from ex-Symbol staff? Q: What mobile units do your current employees use? How many old HE330s are still in regular use with your crew? A: Strange as it may sound, not many of our employees use PDAs. I can’t think of a single employee that has a smart phone either (other than for development projects). A few of us will probably go with smart phones this year. We still have not seen a good marriage of the two products, although some of the new flip-style designs are showing promise. Thanks to Mike and Doug and HandEra for taking time out for our questions. Great products. Great interview. And a fun trip down memory lane. Yes, Thanks Handera! Sure wish the color version would have made it out. I noticed your tagline about waiting for the Color 330 has disappeared and that a tantilizing message was sent to you regarding someonthing on someone's desk a while back, are these two items related? Great interview, and a great company. But there is one thing I disagree with - the 66 MHz Dragonball Super VZ processor did not have very good battery life at all. SJ-33, NR70, NR70v, T-665, and Legend PAM168 all had that processor, and all of those devices had some of the worst battery lives of any Palm OS handheld, including the crowned champ of all - the T-665. Also, I want that color HE330! Are there any more? You're right, Abosco, and while I didn't really forget about those power hungry Clies, I should have elaborated my statement further by saying that those 66mhz Dragonballs were good at being underclocked to save battery power but could be also be pushed pretty high by overclocking when the occasion required it. I remember being bummed that the m515 & Tungsten W didn't have a 66mhz Dragonball CPU upon their release. Thanks for the interview, thanks for the memories - and mostly - thanks for reminding us what an innovative company Handera is ! And I never thought the silver case was ugly! I've noticed on the Handera website, at http://www.handera.com/Products/Software.aspx, the JackFlash and JackSprat software from Brayder is listed, although if you navigate to the "Buy" link for each product, it redirects to the now non-existent Brayder website. The Handera website itself, for "What's New," lists 07/20/05 as the most recent event date. Other than the site "Copyright 2000-2007 HandEra," I don't think it's been changed since around late 2005. I'm confused if HandEra currently exists as an ongoing business or not. Hrm, reading the interview, I guess HandEra still exists. Should update their website though, very weird to be listing discontinued and no longer sold software from other vendors on their site. Still curious about how HandEra ties into Brayder.